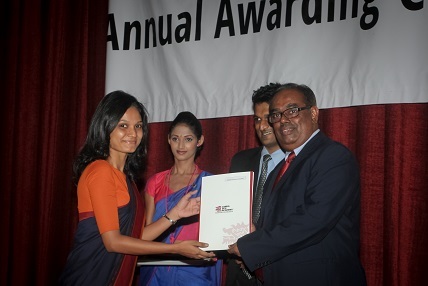 Lanka BPO Academy recently conducted its Annual Awarding Ceremony to felicitate its graduating students. The event held at BMICH, where the Chief Guest was Dr Sunil Jayantha Nawaratne, Secretary to the Ministry of Higher Education. Lanka BPO Academy is an entity dedicated to develop human capital in Sri Lanka, especially focusing on the outsourcing sector. It has collaborated with many international and local partners to deliver various training programs of global standards, to enhance skill levels of individuals and organizations. At the Ceremony, students finishing up programs in Finance & Accounting, Marketing & Customer Service, IT, Business Management and Foundation Programs received their certificates. The special guests at the event included Mr Jeevan Gnanam (CEO, Orion City), Mr Prajeeth Balasubramanium (Managing Director, BOV), Mr Imran Furkhan (Executive Director, SLASSCOM -IT BPO Chamber), Ms. Vishaka Nanayakkara (Senior Lecturer, University of Moratuwa), Mr Dinuk Weerasekara (HSBC , Visiting Lecturer Lanka BPO Academy), Mr Chamila Fernando (Manager, Business Systems Mobitel, Visiting Lecturer Lanka BPO Academy), Ms Radika Perera (BPO Connect), Mr Kanishka Munasinghe (John Keells Infomate), Mr Buddhi Chandrasena (Accenture , Visiting Lecturer Lanka BPO Academy) and Mr Soumya Bandara (Lecturer, University of Kelaniya, Visiting Lecturer Lanka BPO Academy). Dr Sunil Jayantha Nawaratne congratulated the Lanka BPO Academy students for their completion and also explained benefits of becoming job ready graduates. He spoke about needs of organizations today which students need to understand and adopt. The event had participation of students, parents, Lanka BPO Academy staff, industry, special guests and well-wishers. The welcome speech was made by Mr Yasas V. Abeywickrama, CEO of Lanka BPO Academy. He congratulated students for their performance and also reminded them that finishing up studies in not an end but a new beginning. Abeywickrama also spoke about the long way Lanka BPO Academy has come as an organization over many years and the enormous service it has offered the country. Mr Dharshana Illamperuma , Director of Lanka BPO Academy offered vote of thanks. This entry was posted on Wednesday, August 6th, 2014. You can follow any responses to this entry through the RSS 2.0 feed. You can skip to the end and leave a response.